UNOFFICIAL TIP: Try the museum’s virtual tour on their website. The museum’s two-story rotunda is the approximate center of the building, and a good place to reunite if your group is separated. 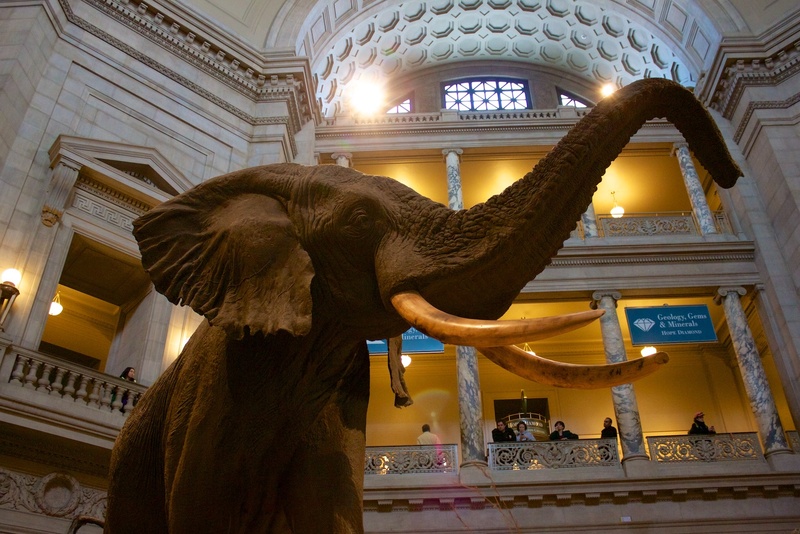 On the first floor of the rotunda is an African elephant named Henry. He’s posted in a state of alert, using his senses to investigate what’s going on around him. The idea, of course, is that you should also be ready to explore what’s around you in the museum. The rest of this section is a detailed exhibit-by-exhibit tour of both museum floors. A complete tour of the museum can easily take an entire day or more. Instructions in the tour below tell you the parts you can skip if you’ve got half a day or less. Exhibits on the museum’s second floor tend to be more kid-friendly and (with a few exceptions) require less familiarity with their background science to enjoy. Like the first floor, we’ll tour the second in roughly a clockwise direction starting with Butterflies + Plants, just off the rotunda. We’ll end up back at the rotunda after seeing Geology, Gems & Minerals. 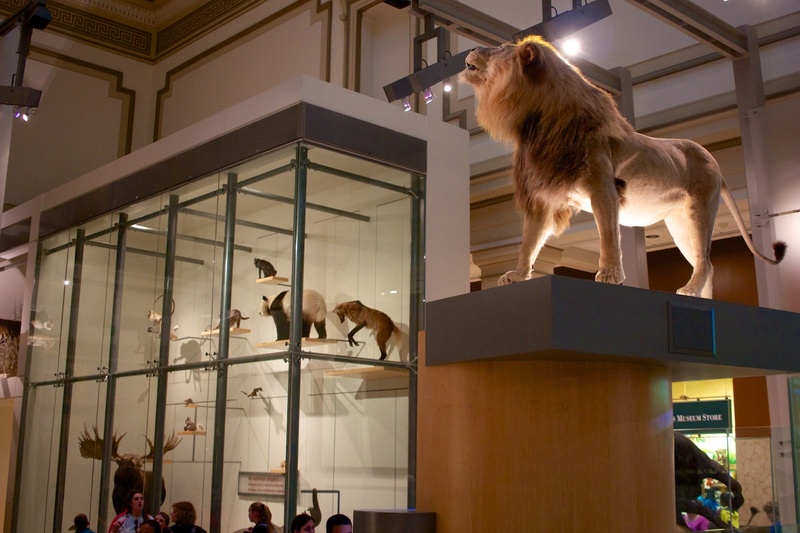 Tour the first floor in a clockwise direction, beginning with the Mammals hall. It’s an impressive place to start because you’re immediately surrounded by lots of big animals. 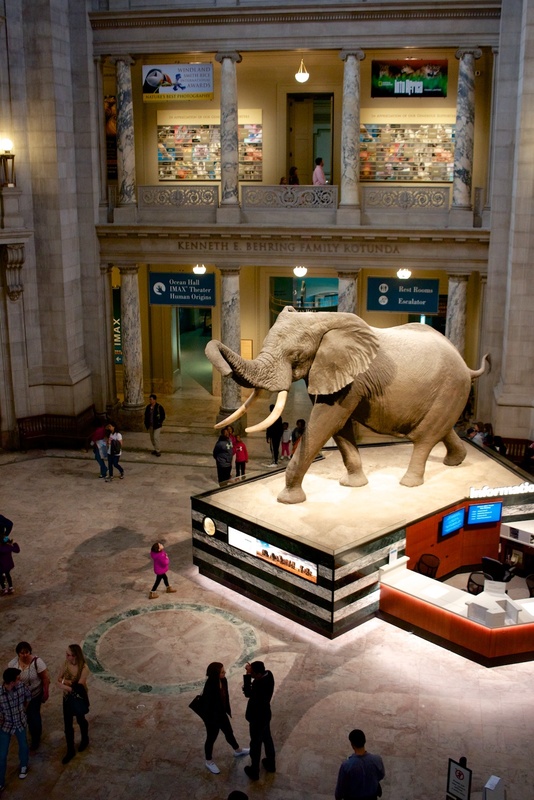 To your left is a two-story display with a life-size moose, white rhino, panda bear, and a score of other creatures; to your right is a similar case with walrus, chimpanzees, horned sheep, and more. Hanging from the ceiling above you is a life-size manatee mother and child, as if they were swimming above you in a stream. 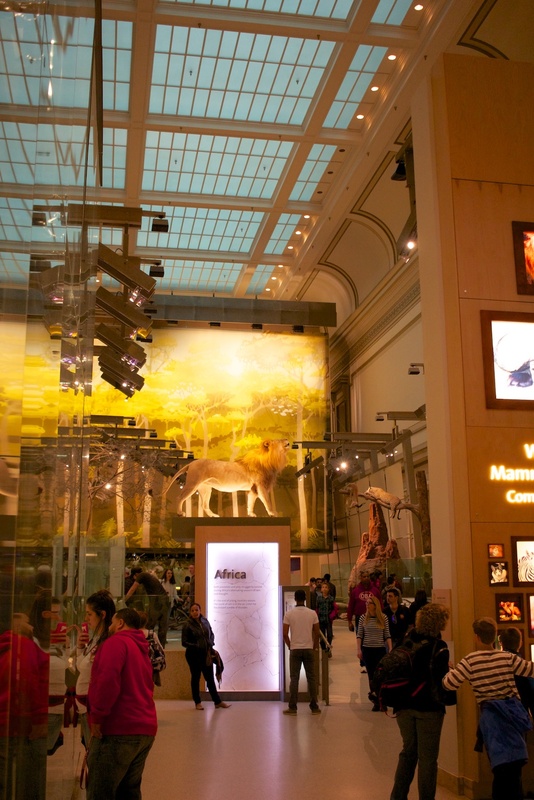 The Mammals hall focuses on the first four characteristics. You’ll see more about brain development in the Hall of Human Origins later on this floor. The story of mammals would be impossible to tell without referencing evolution, so the museum introduces here the six elements of the evolutionary process: environmental change, natural selection, adaptation, innovation, diversification, and extinction. As you view the exhibits in this hall, you’ll see signs explaining the relevant part of the evolutionary process on display. The first group of mammals you’ll see are from Africa, and these animals are used to illustrate the “adaptation” phase of evolution. Before that gets started, though, you’ll see a pair of lions attacking an African buffalo, a stark reminder that all animals are food for something else in the great circle of life. On your right is a Sahara Desert display, showing how mammals have adapted to the minimal water and high heat of the desert. The fennecs, a type of small fox, seen here are nocturnal. By napping in underground burrows that are 40 degrees cooler than the desert, they can avoid the hottest part of the day. Fennecs also have large ears – about a third the size of their entire body – and blood vessels there help dissipate heat. Huge ears are also helpful in detecting the movement of prey at night. Also in this scene are Scimitar-horned oryx and Dama gazelles. Instead of burrowing, these hooved animals have adapted to the desert heat with tall, slender legs to keep their bodies away from the scorching sand; and horns and special blood vessels in their long noses to keep their heads and brains cool. The next scene is the Savanna. On these wide-open plains, an animal’s biggest concern isn’t heat – it’s that predators can see for long distances in every direction, allowing them to spot and stalk prey more easily. In response, animals have developed three basic defenses: fight back, as the sable antelope does with its curved horns; run faster than what’s chasing it, as the gazelles; or outsmart your prey, as shown by the zebra in the Savanna Waterhole display across the walkway. When packed together in a moving herd, the zebras’ stripes make it hard for a predator to focus on a single individual, which increases the herd’s survival rate. Two other interesting things to see in the Africa area: a giant termite mound is used to illustrate how aardvarks and pangolins have evolved to eat these biting insects, with tough hides, big claws for digging, and tongues of up to 2 feet in length; and in the Rainforest display at the end of the room, how the horns of the deer-like bongo are curved backward to avoid getting stuck in brush and low-hanging branches. Unofficial Tip: Regarding evolutionary diversification, the museum notes that there are over 4,000 species of rodent, but fewer than 20 species of aardvark. Just beyond the Rainforest section is a hallway. To the left are mammals from Australia and South America; to the right is North America. We’ll cover these shortly. In front of you, though, is a tall display showing the family tree of morganucodon oehleri, the common ancestor of all mammals, from around 210 million years ago. A small bronze cast of m. oehleri is nearby; it’s the thing that looks like a shiny mouse. The museum has named it Morgie and decided it’s a she. The odd thing about the Morgie display is that the museum doesn’t seem to say why it thinks she’s the oldest mammal ancestor. We’ll say up front that the process of identifying the “first” mammal is like identifying the “first” rock and roll band: even professional musicians will have slightly different criteria, and within the same criterion, there’ll be debate as to whether someone’s music exhibits enough of whatever it is to count. Here’s what we’ve found with Morgie: Remember those displays back at the entrance to the Mammals hall – the ones that said something about tiny ear bones and mother’s milk? Morgie is the oldest known fossil that shows the characteristics of a mammal’s ear bones. It’s a sort of in-between model of ear bone, with some reptilian characteristics and some mammalian, but this seems to be the starting point for mammals. Also, the jaw bones that we have from Morgie indicate that she was born toothless and kept her adult teeth her entire life - the kind of thing you see with mammals who feed on milk from their mothers. Plus, from the fossil record, we know Morgie had hair. Is this conclusive proof? Not for everyone. Besides the in-between ear bones, there’s some evidence that m. oehleri laid eggs rather instead of giving birth to live young, and laying eggs is very rare in the mammalian world (only about 1 per 1,000 species of mammals do, such as the platypus). Because of that, and the in-between nature of the ear bones, some scientists classify Morgie as a mammaliaform, or mammal-like animal, not actually a mammal. All of that said, the natural evolution of even small mammals is usually a process so slow that it’s difficult to comprehend. If you’re a museum that has to answer the question “What was the first mammal”, Morgie is a good response. Beyond the Morgie display is the Evolution Theater, showing a 6-minute movie about evolution. The film focuses primarily on the interaction of environmental change and natural selection, with a couple of cameos by Morgie. Limited seating is provided. The movie isn’t mandatory for understanding evolution or any part of the museum, and can be skipped. To the left of the Evolution Theater are displays with mammals from Australia and South America. Unofficial Tip: If you’re touring the museum for half a day or less, skip Australia and South America and head to your right, through the North America mammals and to the Human Origins hall. Australia is the only place on earth where you’ll find koalas and kangaroos, and this section of the museum highlights how those species have adapted to their environment. How did kangaroos get to Australia to begin with? More than 100 million years ago, the Australian land mass was connected to Asia. Fossils from around that time show that monotremes, egg-laying mammals like the platypus, were present in what would become Australia, as well as marsupials, mammals with a pouch, like kangaroos. Over time, the forces of continental drift pushed Australia into isolation in the South Pacific Ocean. That isolation meant that the monotremes and marsupials had little competition from placental mammals and few natural predators for millions of years. Over the last 20 million years the Australian climate changed from mostly rainforest, to woodlands, grasslands, and desert, with only a tiny amount of rainforest. Two kangaroos displayed here show how those species have adapted to that changing landscape: the Red kangaroo, which can reach 5 feet in height, can hop long distances across the grasslands with a heavy tail for balance, long back feet for pushing off from the ground, and powerful back legs. In contrast, the much smaller tree kangaroo is built for climbing and living in trees, with all four legs of about the same length, smaller, flexible feet which curve around branches, and curved claws to help their grip. An adult kangaroo has few natural predators. One of the largest, shown here, is the Australian dingo, which appeared in Australia fewer than 4,000 years ago. A display here illustrates how dingoes hunt in packs, and how that cooperative hunting style helped them survive against Australia’s only other big predator, the thylacine. The other interesting display in this area is on the monotremes, which include the platypus and echidna, and are found only in Australia and New Guinea. The echidna looks like the tiny result of a wild night between a porcupine and an anteater – they’re adorable, and there should be a cartoon character based on one. South America Next on the tour is South America, just down the side hall from Australia. More mammals live in South America than anywhere else on earth. 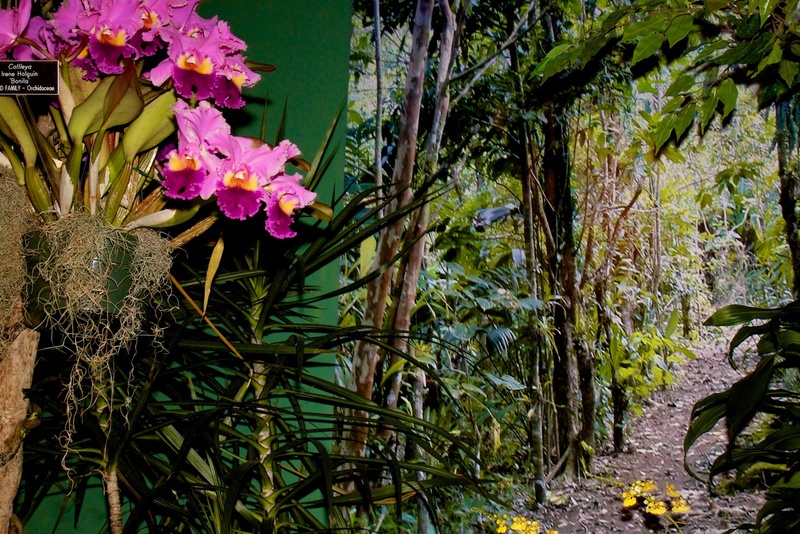 These exhibits focus on the animals that live in the rainforest canopy and how they get their food. Animals featured include the Southern squirrel monkey, which hops between trees looking for fruit and insects; the Jamaican fruit-eating bat; and the pygmy marmoset, the world’s smallest monkey. Because of its size, the marmoset has developed a set of teeth that dig into trees like tiny saws, allowing the tree’s sap to flow. The tree sap provides an important source of calories for the marmoset, which supplements its diet with small insects. Also living in the tree branches is the three-toed sloth. What’s interesting about the sloth is that it eats only tree leaves, and hasn’t expanded its diet to include insects, fruit, or tree sap. The display notes that to cope with this low-calorie lifestyle, sloths conserve energy by being among the slowest-moving of all mammals. The last section of the South American mammals focuses on the adaptations of those that live on the forest floor, from the long tongues of the anteater to the grass-cutting teeth of the capybara. North America When finished with South America, head across the hall to the exhibit on North America’s mammals. North America’s climate and landscape vary tremendously, from rainforests to tundra, and from very warm to very cold. The mammals shown here demonstrate the ability to adapt to these different conditions. 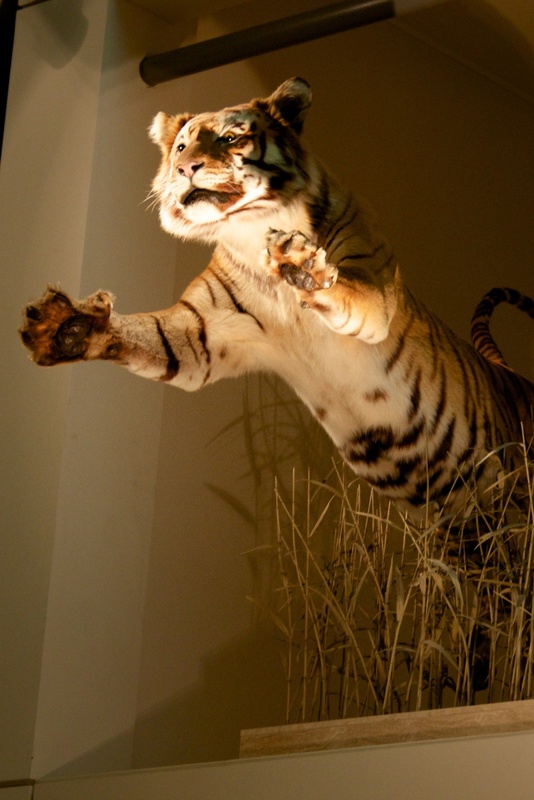 The museum separates the cold-weather mammals from the rest of the displays, to focus on those animals’ ability to stay warm and find food through the winters. Adaptations on display here include different hibernation strategies, from naps of a few hours to a few months; “goose bumps” – small-muscle contractions that cause body hair to stand on end and trap air close to the surface; shivering, which rapidly contracts and relaxes muscles to generate heat; blubber, which keeps marine mammals warm in cold water, eating frequently to boost metabolism; and huddling together for warmth, which reduces an individual’s surface area exposed to cold air. Animals shown include the everything from small red squirrels, to Canada lynx, to polar bears. Two detailed displays in this section show how larger mammals have adapted to the cold. In one, the caribou have adapted cool, long legs and hooves near the snow, with a warm upper body that protects its vital organs. In addition, the caribou’s hair traps warm air close to its body. To find food, the caribou migrate more than 600 miles from their summer homes during winter. Also shown are two North American bear species: the brown bear, North America’s largest living carnivore, and the polar bear. These bears’ paws are compared in this display, showing how the brown bear’s paw has evolved to live on land while the polar bear’s paw has adapted to life in cold water and on ice. Unofficial Tip: If you have children, point out the similarities in body types between animals from Africa’s savannas and North America’s prairies. The remainder of North America’s exhibits covers the prairies and forests. Because the prairies are, like Africa’s savannas, wide-open expanses of land in which animals can’t hide from predators, you’ll see animals here have developed characteristics similar to those in Africa. In particular, the bison and pronghorn antelope have long legs to help them run fast. They also tend to live in herds for safety. Remember the African fennecs that burrow underground to stay cool during the hottest part of the day? In North America, the black-tailed prairie dog and black-footed ferret shown here do the same thing, for the same reason. The last part of the North America section is Spring Forest, with animals that will be familiar to most families living in the eastern United States and Canada: cottontail rabbits, white tailed deer, squirrels, opossums, mice, and weasels). The displays here focus on how these animals create and raise their young. One of the more interesting illustrations is a comparison of the reproductive strategies of the deer and deer mouse. In a typical 12-month cycle, a female deer will give birth to 1 or 2 fawns in the spring, and spend the rest of the year raising them. The low number of children, the attention given by the mother, and relatively few predators (especially in the eastern U.S.) means the mortality rate for deer is relatively low, and the chances are good that the fawns will survive long enough to have their own children. Contrast that with the high mortality rate of the deer mouse, whose offspring are eaten by everything from snakes and owls, to wolves and outdoor house cats. Because they have a substantially higher mortality rate, deer mice have evolved to give birth several times per year, to large litters of young. In fact, a deer mouse can reproduce four times as often as a deer, with the mouse’s offspring able to give birth before a deer’s fawns have even left their mother. 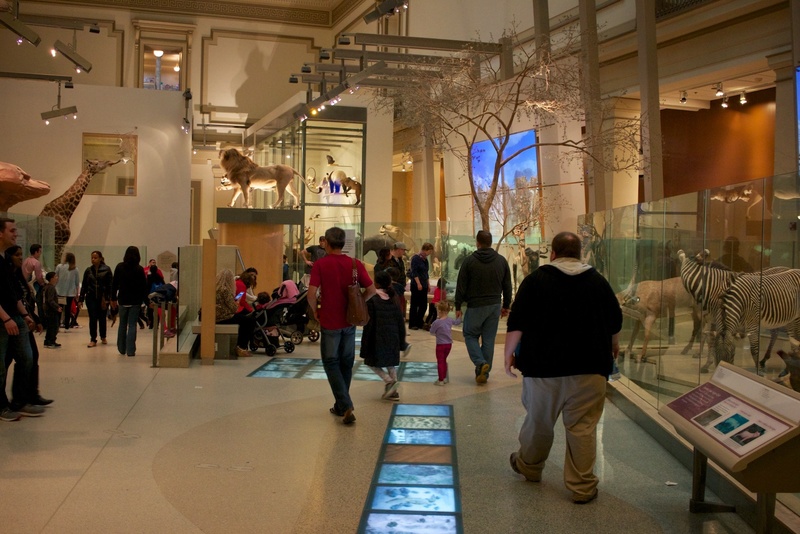 The museum’s Hall of Human Origins shows how humans have evolved over the past 6 million years, in three major areas: the separation into a distinct branch of the apes; the adaptation to a changing Earth’s climate; and the changes needed to survive as humans spread to all corners of the globe. The museum begins the story by noting that humans are primates and part of the “great apes” family that includes orangutans, gorillas, bonobos, and chimpanzees. We share a common ancestor with chimpanzees, one that lived between 6 and 8 million years ago. Two of the major things that set human ancestors apart from other ancient apes are the ability to walk upright on a regular basis; and small canine teeth in both males and females. Walking upright makes it easier to get around a wide variety of landscapes, and smaller teeth may have been the result of eating more meat and fewer plants, since plants required bigger teeth to tear and chew. The first display you’ll see when entering the hall is that of four fossil skulls from human ancestors, the earliest of which dates to around 6 to 7 million years old. Along with each skull is a short explanation of how ape-like and human-like the species was. The oldest fossil, known as sahelanthropus tchadensis, was found in Chad in 2001. What’s interesting about this fossil is that it shows the place where the spinal cord meets the brain shifting to underneath the skull from the back of the skull. That’s an indication that the animal could walk upright on a regular basis. Coupled with small canine teeth, it’s enough for many scientists to accept s. tchandensis as the earliest entry on our branch of the family tree. If you’ve got kids, they’ll enjoy the pair of photos to your right, showing the similarities between a small child hanging from a playground toy and a chimpanzee hanging from a tree: flexible wrists, elbows, and shoulders; a broad chest and shoulders; and a stable backbone. As parents who’ve encouraged their children to make monkey noises as they play on jungle gyms, we’re not surprised at this observation. To the side of the hall is a set of interactive games. In one, you’re the ruler of a country, trying to guide it through economic growth, natural disasters, and social change. Another deals with rising carbon dioxide levels associated with global warming, and a third covers how humans have changed the world through things such as agriculture and animal domestication. None of these are directly related to human origins, but they’re short, fun diversions if your children look like they need a break. The next major display, titled One Species, Living Worldwide, is a collection of human (homo sapiens) skulls from around the world, dating from 4,700 to 200,000 years old. These skulls show how these populations spread from Africa to Europe, Asia, and beyond. There’s a short movie that goes along with the display – view it here. The interesting thing about the movie is its observation that modern biologists reject the idea of human “races”, reasoning that the DNA of all people is 99.9% identical, and differences in things like skin, eye, and hair color are variations along a spectrum of colors. What were humans like before 200,000 years ago? The next section discusses that, in a display titled Two Species, One Survivor, comparing Neanderthals to modern humans. On a more cheerful tone, the wall opposite the Neanderthals contains Imagination Takes Wing and A World of Symbols, a look at the art, language, music, and decorative arts created by early humans between 30,000 and 60,000 years ago. There’s a replica cave wall, with paintings of people and animals, and background music made with a reproduction of a 35,000 year-old flute. In nearby cases are small sculptures of everything from mammoths and horses, to swans and geometric designs; examples of early writing; and personal jewelry and cosmetics, which may have first been used in funeral ceremonies. Farther down the hall are two large, walk-in, interactive displays showing how researchers evaluate a site for potential clues regarding the humans that lived there. In the Burying the Dead display, you’ll see the clues that researchers uncovered in Shanidar Cave, Iraq, showed Neanderthals buried their dead as early as 65,000 years ago – a first among primates and humans. And in Surviving the Dry Times, from Olorgesailie, Kenya, million-year old fossils give clues as to how early humans worked together in social groups to share food and raise their young. A museum display such as Human Origins runs the risk of fossil fatigue, where all the skulls start to look the same, and important but tiny distinctions are often overlooked or skipped. To get around that, Human Origins has built a series of replica heads, with hair, eyes, and skin, of the major human ancestors, including homo heidelbergensis, homo erectus, and Neanderthals. Each head is in a glass case, set to the average height of that species. We’d love to see these sold in the gift shop. Beyond the replica heads is another interactive kiosk, titled What Would You Look Like as an Early Human? A small digital camera takes your photo, and slowly morphs your face so that it has the features of one of eight species. Kids love it, and although there are several kiosks available, there’s usually a short wait of a few minutes to get in front of a camera. The next set of displays covers how human brains evolved faster during the last big round of climate changes – good news for us today! Nearby, another display shows how different body shapes evolved based on their local climate, from the short, round bodies that conserve heat in colder climates, to the taller, thinner frames found in warmer areas. Finally, a set of panels that show how the use of stone tools and fire helped humans access different food sources not otherwise easily available. There’s a mesmerizing video in this display, showing you how to make your own hand axe to butcher meat and scrape bone marrow, in case you’re looking for ideas for dinner. The last model in Human Origins is that of an australopithecus afarensi, commonly known as Lucy. Found in Ethiopia, these 3.2-million year old bone fragments continue the story of ape-to-human transition started at the beginning of the hall. Among Lucy’s human-like traits are angled knees and a short, broad pelvis, both indications that Lucy spent a great deal of time walking upright. But, as we said with Morgie the mammal, evolution is a slow process, and Lucy still retains some ape-like traits, including long arms and fingers, and flexible feet. All of these characteristics indicate that Lucy spent a lot of time in trees, too. The Hall of Human Origins ends at the back of Ocean Hall, a major exhibition space dedicated to marine animals. Because of the way the exhibits are organized, it’s better to start your tour at the front of the hall, near the archway to the rotunda. Work your way to the back of Ocean Hall from there, then turn right into African Voices. Ocean Hall is a rectangle divided into three parts along its length. 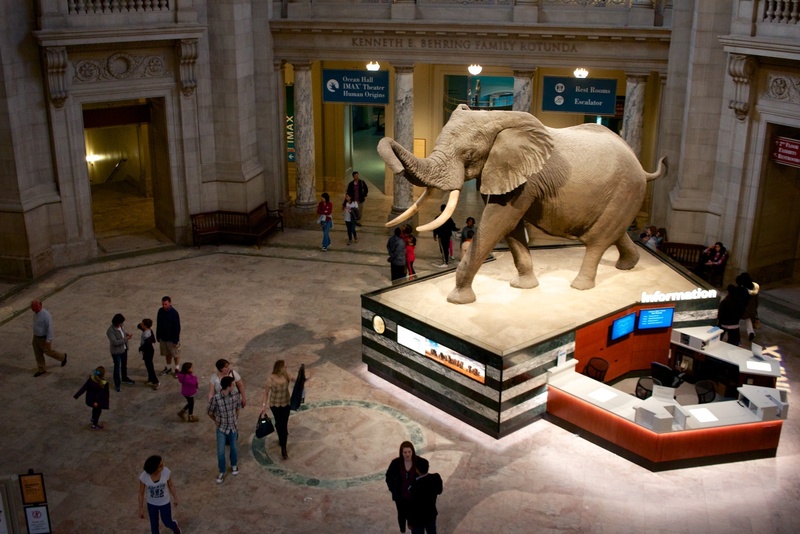 The middle part is the main hall, containing most of the large animal specimens and displays showing where they live. The smaller left side contains marine fossils dating back billions of years, illustrating how life evolved in the seas. The right side is broken into small, separate rooms with multimedia presentations about various ocean topics, such as how the oceans affect earth’s climate. We’ll cover the main floor of Ocean Hall first. The front of the hall, just off the rotunda, contains presentations on the ocean’s biodiversity. Three large glass cases contain dozens of ocean animals, photos, and informative posters; in one case, a 20-foot tall, pink and white jellyfish extends out from its case, its head near the ceiling and tentacles flowing back inside the glass. Who is it related to? How big (or small) is it? 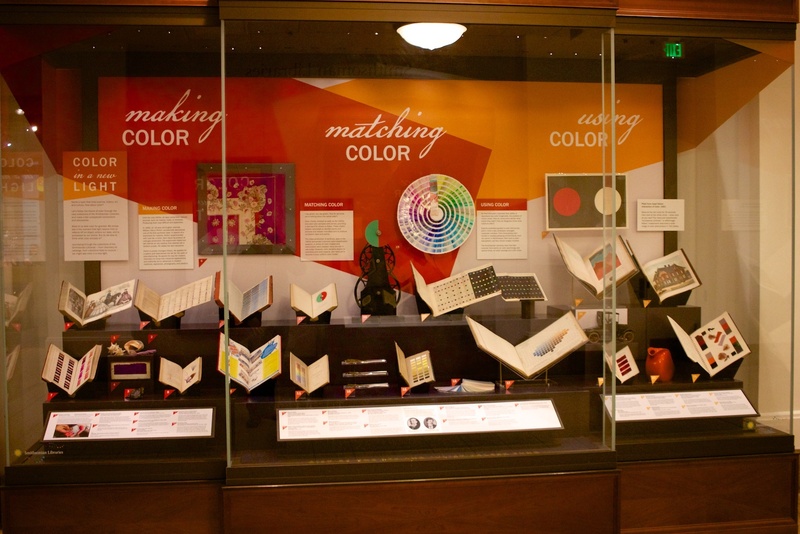 Each display case has a section devoted to each question. In one of the Who is it related to? examples, there’s a nice set of around 3 dozen cone snail shells. These snails are small mollusks that live in shells that look like ice cream cone. What the display shows is that while the size, shape, and patterns of the cone vary quite a bit, all cone snails are closely related species. Unofficial tip: What kid doesn’t want to know more about gelatinous zooplankton? One of the Where does it live? sections holds the giant jellyfish, and uses the jellyfish to explain why where an ocean animal lives greatly affects its body shape. Jellyfish live near the ocean’s surface and in its water column, so its stinging tentacles hang down to capture fish below it. In contrast, anemones live on the ocean floor, and their stinging appendages float upward to catch their prey. That’s an indication that while they both use tentacles to catch food, jellyfish and anemones aren’t closely related. Finally, the How big (or small) is it? sections are a bit unclear to us. There’s a section on how big sharks can get, for example, and one that compares the size of underwater kelp forests to tiny phytoplankton invisible to the human eye, but neither of them really explains how size factors in to a classification scheme. If there’s a rationale here that we’re missing, send us an email to let us know. Above and around each of the biodiversity cases is a beautiful collection of animals, including sharks, leatherback turtles, lobsters, and giant crabs. The end of the biodiversity section has a nice poster on the ocean’s tree of life, showing how all living things in the oceans are related. Following the biodiversity lesson is a presentation on sharks and humans. Before we get in to that, we must disclose, dear reader, your author has an irrational fear of sharks; he cannot snorkel in the open ocean without hyperventilating, and he considers the Sharknado films a documentary. That said, the Smithsonian notes that tens of millions of sharks are killed each year, often just for their fins (to use in soup). Sharks are a natural predator of rays, which each clams as part of their diet. So when there are fewer sharks to eat the rays, there are more rays and fewer clams for your dinner. The center of Ocean Hall is dedicated to a 43-foot long North Atlantic Right Whale named Phoenix. Researchers have studied Phoenix from her birth in 1987 (she’s still alive as of this writing), and the displays in this part of the gallery show her growing up, her migration patterns, diet, and more. There’s also quite a bit on the whaling industry, from how it got started supplying whale oil for homes and industry, to the destructive impact on global whale populations. There’s also a section on the indigenous peoples who still practice small-scale whale hunts as part of their culture and diet. The back of the Ocean Hall is dedicated to the open ocean. 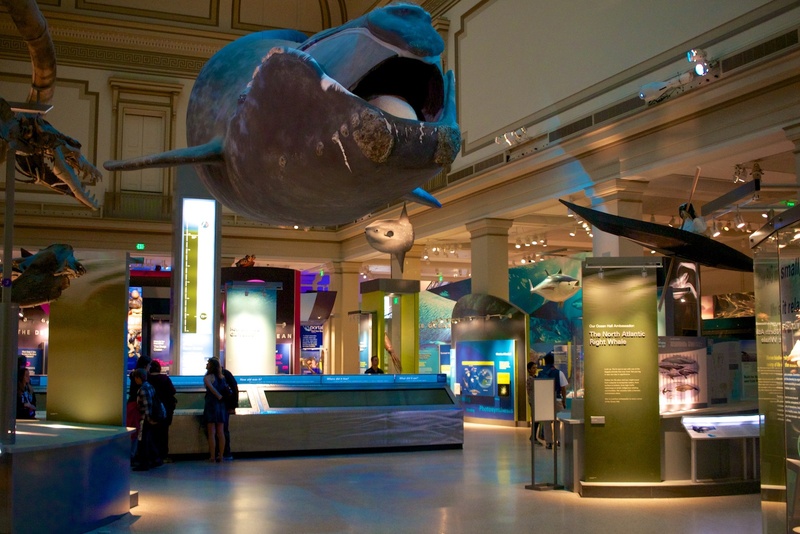 Separating this section from the rest of the hall is a long, thin, display case holding a giant squid, 36 feet long and weighing over 300 pounds. Once mistaken for a sea monster, people have claimed the existence of giant squid for thousands of year. But because they live in the deep ocean, very few specimens have been caught, and those that have were usually badly damaged or decomposed by the time scientists got to them. In fact, no photograph or video had ever been taken of a live giant squid prior to 2004 – unusual for something of this size. The one you see here comes from off the coast of Spain, in case you’re wondering where not to swim. Beyond the giant squid, the hall is organized into three areas, depicting life in different ocean zones. In the shallow Surface Zone, sunlight is abundant and makes photosynthesis possible. That means plankton can live, and they provide food for a wide variety of other animals. Sunlight has its downside, too, namely that you’re easily seen by the things that want to eat you. (It’s a similar situation to the African savanna and North American prairie.) To deal with this, animals have developed three strategies: sardines stay together in large schools, providing safety in numbers similar to how gazelles and zebra congregate; blend in with their surroundings, as do the transparent jellyfish and camouflaged sharks; and use speed to escape, like the Sargassum flying fish and Humboldt squid. The next-deepest layer is the Twilight Zone, where there’s much less sunlight and food. Animals that live here have developed huge eyes to see better in the dark, and larger mouths (compared to their body size) for eating anything they can catch. Also, many animals found at these depths have developed some kind of bioluminescence: the anglerfish uses a glowing, antenna-like piece of skin in front of its mouth to attract prey; other creatures use bioluminescence to attract mates or scare off predators. The bottom of the sea is known as the Deep Ocean, and is described by the museum as essentially a river of mud. There’s very little food here, and enormous pressure due to the volume of water above. Those mean that most bottom-dwelling animals are either stationary or slow-moving, with large mouths and watery bodies that float easily. Another interesting thing found in the deep ocean, near hydrothermal vents, is chemosynthesis, the process by which tiny microbes make energy not from light (the way plants do with photosynthesis), but with chemicals from the earth’s core, exposed as vents when the earth’s crust moves. The idea that this was even possible was so revolutionary that it was only confirmed in the last 50 years, when deep-water submersible robots were able to reach the ocean floor. Special Exhibits Gallery 4, at the back of Ocean Hall, is usually dedicated to photos, multimedia, and art related to ocean exploration. Past exhibits have covered the depths of the North Atlantic, coral reefs, and x-rays of fishes. The most recent exhibit was titled Portraits of Planet Ocean, and featured large-format color photos of tuna, sharks, whales, and more. When you’re at the back of Ocean Hall, look to the right for a small room titled The Polar Oceans. This pathway, which goes through another series of ocean exhibits that lead you back toward the rotunda for the last part of the Ocean Hall tour. Just before the Polar Oceans is a display of a coelacanth – a huge, lobe-finned fish thought to be extinct for 65 million years, until one was found off the coast of Africa in 1938. There are only two species of these fish alive, and they’re thought to have evolved into their present form around 400 million years ago. These fish have evolved a couple of interesting features, such as a hinged skull that allows the back of the head to move up, so the fish can eat larger prey; and lobed fins that move more like the legs of a trotting horse. Fish, on the other hand, aren’t mammals – they’re cold-blooded – so they don’t have blubber. They still have to worry about not freezing, however, especially in icy waters. To do that, the bodies of many fish create their own antifreeze, in the form of a protein that binds to ice crystals and prevents them from expanding and causing cell death inside the fish. It only works for temperatures a couple of degrees below freezing, though, so you can’t squeeze a herring into your car’s radiator every winter. The Shores and Shallows section of the hall contains some of the gallery’s best models. First up is a huge model of a Chesapeake Bay estuary, with real water, plants, and blue crabs. Illuminated panels next to the estuary show the lifecycle of the blue crab, which sees it travel throughout the bay to hatch, live, and mate. Besides the crab’s lifecycle, the estuary describes how animals in the estuary deal with varying levels of salt in the bay’s water, either by leaving temporarily, adapting their bodies to the higher salt content or flushing it out through specialized processes. The other good model in this section shows beach erosion in action, in a clear, plastic-walled model filled with sand and water. The display notes that while some beach erosion happens naturally, it often happens where people have built homes and businesses. In those cases, some anti-erosion efforts can harm wildlife by pushing the effects off to other beaches where those animals build nests or mate. The third display in this section is a coral reef packed with colorful fish and plants. It’s a mesmerizing collection of yellow angelfish, pajama cardinalfish, bicolor blenny, shrimp, anemone, and more, modeled after reefs found in the Indo-Pacific ocean. Kids love it, and there’s often a group of people standing wide-eyed in front of it. The thing to notice is how many different species share this relatively tiny space. They’ve evolved behaviors to share the space, by, for example, being active at different times of the day, or by staying within a relatively confined area of the reef. If you’re touring the museum for half a day or less, take a break for lunch and then begin your tour of the second floor with our coverage below. If you’ve got more time, however, continue walking the rest of Ocean Hall. The last two small parts of this side of Ocean Hall: Global Ocean Systems, showing how the oceans interact with earth’s atmosphere and soil; and Ocean Today, with the latest news on marine research. Once you’re back at the front of Ocean Hall near the rotunda, bear left to the Journey Through Time area. The first display, on the evolution of predator fish, is based on the idea that you may not be having enough nightmares. We say that because all of these fish look terrifying, from the 25-foot long placoderms with spear-like jaws, the helicoprionid sharks whose mouth are described as “a buzz saw with fins”; the mosasaurids, 50-foot, air-breating, marine lizards; ammonites, the size of a grown man and the looks of a giant, angry snail with tentacles; and, of course, the giant great white shark. Next up is a section titled The Explosion of Early Life, starting with 3.5-billion year old microbes, which gave off oxygen as part of their photosynthetic respiration cycle. These microbes were apparently the main form of life on the planet for a couple of billion years, up until around 600 million years ago, when many more diverse forms of life, including multi-celled algae, and hard-shelled animals started to appear. Why did different forms of life appear, and how do we know it was 600 million years ago? Both answers may be “oxygen.” Billions of years ago, the earth’s atmosphere contained far less oxygen than it does today – as little as 1%. As these ocean-dwelling microbes gave off oxygen, the oxygen attached itself to iron and other organic elements in the water, keeping the oxygen in the seas. Eventually, the microbes produced more oxygen than the oceans could store, and the oxygen made its way into the atmosphere. Once in the air, free oxygen binds with iron on land to form iron oxide, and scientists have dated rocks with iron oxide to around 2.2 billion years ago. Based on those rock samples, there seems to have been a large jump in the amount of atmospheric oxygen around 600 million years ago. Animals produce hard shells and skeletons in a process called biomineralization. All living things do this to some extent, and it may have evolved as a way for simple sea animals to excrete extra calcium carbonate from the ocean’s water. The evolution of hard shells was a big evolutionary advantage because it allowed for larger body sizes and the ability to move around in search of food and mates. The basic body plans of all modern animals were set during the Cambrian period, 542 million years ago. There are some good displays in this section, showing the relatively fast growth in species around this time. What caused this rapid explosion in animal shapes? The two theories outlined are the changes in the earth’s climate and ocean oxygen levels we’ve mentioned, and competition and predation among the animals that had started getting more complex. One of the hard-shelled organisms that flourished around this time was the trilobite. We’re being charitable when we describe these fossils as giant ocean cockroaches, and they are indeed distant relatives of both insects and lobsters. Like insects, trilobites were very good at finding food and reproducing – they were the dominant form of life on earth for millions of years. Then a mass extinction wiped them out. The last set of displays in Ocean Hall explains how this happened. There have been 5 mass extinctions in the earth’s history, and scientists are debating whether we’re in the sixth right now. Extinction events can be caused by many things. In the case of the trilobites, evidence suggests that a volcanic eruption did them in, along with 95% of everything else alive - in the Permian-Triassic extinction of 250 million years ago. They can also come from space, as in the huge meteor that slammed into Mexico 65 million years ago, wiped out the dinosaurs, and marked the end of the Cretaceous period. Your tour of Ocean Hall is finished after the displays on mass extinction events. If you’re doing a comprehensive tour of the museum, continue to the back of Ocean Hall and turn right and walk through the Mud Masons of Mali photography exhibit, and African Voices. 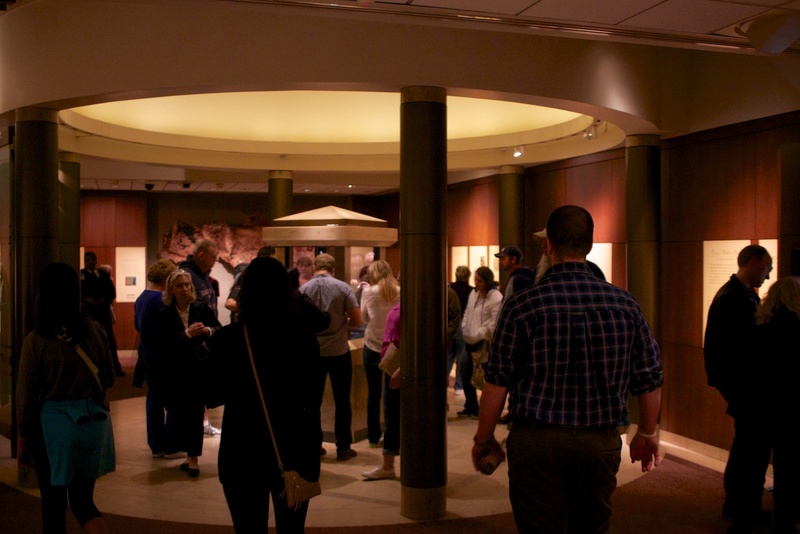 If you’re touring the museum for half a day or less, head to the second floor’s exhibits now. African Voices is an ongoing special exhibit of Africa’s peoples, cultures, and economies, and their influence around the world. The exhibit is divided into themed sections on either side of the gallery, described below. If time is short, however, the gallery’s center walkway, called Walk Through Time, summarizes much of the content. If you’re doing the full tour, the first section of African Voices is titled Living in Africa, and it covers everything from simple wood and stick houses, to public spaces. A highlight is a Somali portable house, made of sticks bound together with twine, and built by the women of the family. Its basic framework is small and light enough to be carried by a camel. In Somali culture, women own the home, and it’s eventually inherited by her daughters. Also on display here is a set of carved house doors from Zanzibar, which separate private residences from public spaces and are a visual indicator of a family’s wealth. The next section is titled Kongo Crossroads, covering the interactions of the Kongo people with Americans during the time of the African slave trade. The displays show that some of these cultures’ religions seem to have adopted elements of the others they saw. Next up is a section titled Global Africa, highlighting Africa’s approach to global problems such as the balance between conservation and commerce. In Tanzania, for example, tourism is a huge source of revenue, and visitors come to see the native wildlife. Setting aside large swaths of land for tourism sometimes conflicts with the lives of Tanzania’s indigenous people, such as the Maasai, so the Tanzanian government has set up the Ngorongoro Conservation Area to try to balance out everyone’s needs. The far end of African Voices is the Freedom Theater, with displays and a short film on the history of slavery and apartheid, including the Americas from 1626 through 1865, and South Africa until 1994. It may seem unusual to have a film about slavery in a museum dedicated to natural history, but this one is well done. If you’re looking for a quick break, stop by this tiny theater for a few minutes. Walking back up the right side of the African Voices hallway, you’ll next see Working in Africa, with examples of pottery-making and metalworking, with examples ranging from folk ark decorations to gold jewelry made for royalty. The metalworking display leads into Market Crossroads, one of the best parts of African Voices, showing the central role of outdoor markets in many African cities. The market here, from Accra, Ghana, holds up to 30,000 traders selling everything from food and household goods, to clothing and auto parts. Check out the clothing prints on sale in the market – each print or pattern on display tells a story, and the story is summarized on signs next to the prints. The final section of African Voices is Wealth in Africa, with wealth defined as money, knowledge, and personal connections. There’s an unusual, airplane-themed coffin at the end of this display, which we suppose demonstrates the deceased’s status and passion for flying. This gallery explains how evolution creates diversity, using butterflies and flowers as an example. More than 170 million years ago, there were neither flowers nor butterflies. The fossil record shows, however, that 5 moth species existed, flying at night and feeding on plant pollen and leaves. Flowers first appear in the fossil record around 102 million years ago, bringing nectar as a new food source. Moths seem to have evolved a short, tube-like tongue to eat the nectar, and the moths’ flying from flower to flower helped to pollinate these new plants. A giant meteor caused a mass extinction at the end of the Cretaceous period around 65 million years ago, taking with it the dinosaurs and most other forms of life. It took millions of years for the earth to be repopulated, and with the old species wiped out, new forms of life sprang up. Some of the plants that evolved during this time were deep-throated flowers, whose pollen and nectar were hard to reach. Several moth species evolved even longer tongues to reach this food, however, and around 48 million years ago we see the first daytime moths – butterflies. Like moths, butterflies use their antenna to sense wind and smell food. However, butterflies seem to have also acquired the ability to navigate using the sun’s ultraviolet light, letting them fly during the day. Flying during the day would have allowed butterflies to avoid their main predators – bats and owls – which feed mainly at night. However, birds would also feed on butterflies, and the displays here point out how butterflies developed colorful camouflage to blend in with the flowers around them. Also in this hall is a Live Butterfly Pavilion, a remarkably large, plastic dome holding thousands of actual butterflies and the plants that support them. There’s a separate charge (around $7 per person) to enter the pavilion, and often a short wait because of its limited capacity. Once inside, however, there are additional displays on the co-evolution of butterflies, moths, and plants. Beyond the butterflies is the Live Insect Zoo, ingeniously sponsored by Orkin Pest Control. The main draws here are the various insect terraria, with land- and water-based bugs. Most of these glass cases are arranged a foot or two off the ground, at the correct height for small children to peer into without being held by an adult. For each insect, the museum explains its typical habitat, diet, and lifecycle. In the case of water-based insects, there’s an informative illustration of how insects “breathe” under water by trapping small air bubbles next to their bodies. The largest of the insect displays is a life-size termite mound, used to illustrate how insect societies work together to support a colony. The middle section of the zoo explains the evolutionary traits that allow insects to populate every nook, cranny, and crack on earth: high reproductive rates, short lives, and specialization. That allows billions of tiny gene crossover and mutations to happen every day, ensuring that different biological forms get tested. Using these evolutionary traits, insects have developed a range of defenses to predators, including the camouflage described earlier, and mimicry of markings. In the case of mimicry, an insect will adopt the coloration and markings of another insect that’s known to be distasteful to predators, because the predators leave those bugs alone. Unofficial Tip: If you want your kids to ever sleep at night, walk quickly past the next part of the tour, which includes huge bugs from 300 million years ago, such as giant cockroaches, scorpions, spiders, and more. Farther down the gallery is a large interactive display showing how insects live in and around our houses. It features kid-sized computer screens and chairs, allowing kids to explore several species found in most homes. There’s also a wall-size display discussing what an entomologist does, and a game where kids try to match the insects to the things they produce (bees make honey, some works produce silk, and so on). After the insects is a relatively small area with Egyptian mummies, artifacts, and the religious beliefs behind them. To prepare a deceased family member for the afterlife, they were often buried with the things they’d “need”, such as cooking utensils, tools, and other everyday objects. Also buried with the dead were offerings to the gods, in the form of animal mummies, such as cats, crocodiles, and birds – even a highly prized Apis bull mummy. Also featured in these displays are intricately decorated Egyptial burial masks and sarcophagi. One, the coffin of a woman named Tentkhonsu, is decorated with a mural that tells the story of how the gods will test her heart for virtue after death, before deciding whether to grant her soul rebirth. 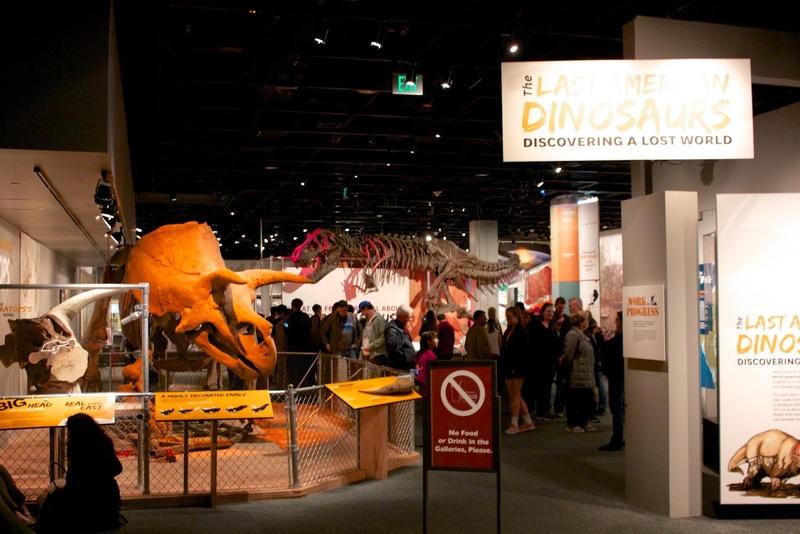 One of the largest and best exhibits on the second floor is a collection of dinosaur fossils from the Hell Creek Formation in the United States’ upper Midwest and Rocky Mountains. 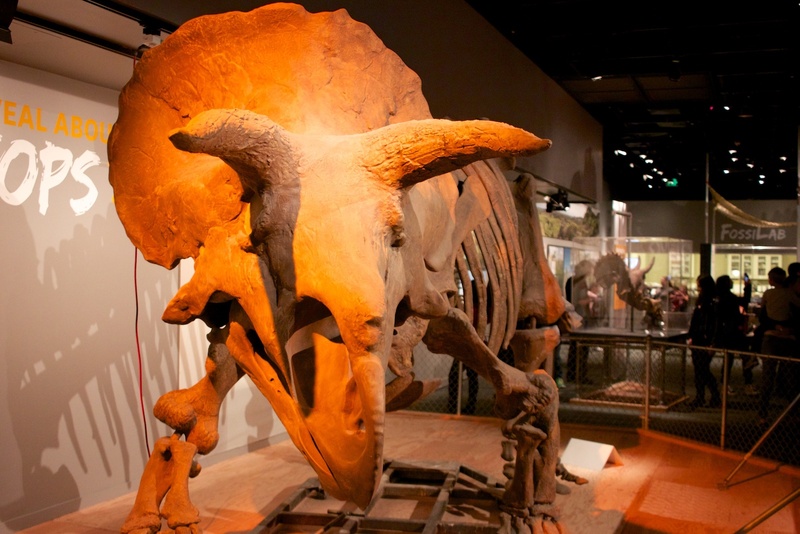 Here you’ll find a 30-foot, 3-horned Triceratops skeleton, and a 40-foot Tyrannosaurus Rex. The great thing about these dinosaurs is that they’re standing at ground level, easy for kids to see, and without any plastic or glass case around them. You can’t touch them, but you’ll be close enough to appreciate the size of these animals. (There are dinosaur fossils you can touch nearby, including an edmontosaurus annectens, a 30-foot long, duck-billed plant-eater.) 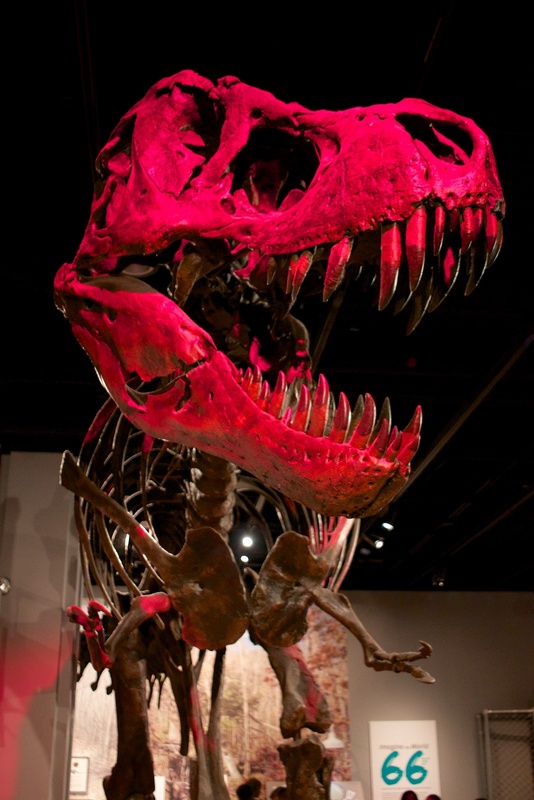 Besides these headliner dinosaurs, fossils from many others are shown around the gallery, including raptors and fish. The most important part of the Dinosaurs gallery is the explanation of how these animals went extinct. Until 1980, most scientists thought that a long period of worldwide volcanic activity around 65 million years ago, threw enough ash and lethal gasses into the atmosphere to kill off most plants and, eventually, the animals that fed on them. In 1980, the father-and-son team of Luis (a physicist) and Walter Alvarez (a geologist) published a paper observing that rock formations around the world all include a thin layer of clay containing ash, shocked quartz crystals, tiny diamonds, and unusual quantities of minerals such as iridium, typically found on asteroids. The museum has on display several core samples, obtained by drilling deep into the earth, clearly showing this thin, colored layer of clay between two ordinary-looking layers of rock. The Alvarez’s theory was that a huge asteroid crashed into earth 66 million years ago, sending up dust and debris around the globe, blocking sunlight, and then killing most plants and their consumers up the food chain. It was a controversial theory that was not initially accepted by most geologists, who pointed out that an asteroid big enough to do that kind of damage would have left an enormous impact crater, which the Alvarez team had not found. However, two geologists using radar to look for oil deposits in Mexico later realized that such a crater did exist, in the ocean off the coast of the Yucatan peninsula. That crater, more than 110 miles wide and 12 feet deep, has been dated to exactly the same age as the worldwide clay ring with the iridium deposits. While some scientists today believe that volcanos and climate change helped kill off the dinosaurs, the “impact hypothesis” is the generally accepted cause of the dinosaur’s extinction. The asteroid impact killed off most of the species alive at the time. When the proverbial dust settled, new life forms began to emerge and fill in the habitable parts of the earth. Among these were mammals and birds, which make up a large part of the earth’s ecosystems today. At the end of the Last American Dinosaurs section is a small hallway with an exhibit titled Backyard Dinosaurs. It features a map showing where in the United States you’d find rocks of the right age to contain dinosaur fossils. There’s also a diorama showing what the area around Washington D.C. might have looked like during the Cretaceous period, with fossil evidence of ferns, plants, snails, turtles, and Strom Thurmond living nearby. This gallery, off the rotunda to your right, shows how animals that do the same thing – climb, fly, or swim are examples – have evolved similar skeletal features, even when the species aren’t that closely related. For example, sloths and apes have curved feet and hands for climbing trees. The interesting thing about these displays is that they’re almost all complete skeletons, not individual bones or bone fragments. Children will find it easier to identify the animals related to each skeleton, and it’ll be easier to see the similarities. A subset of the displays in Bones is called Skeletons in Motion, and shows the evolution of joints, muscles, and bone shapes for birds that fly, swim under water, and run (with specific coverage of aquatic, semi-aquatic, and terrestrial birds). There’s also a set of displays showing the evolution of skeletons, limbs, and motion, and jaws and teeth for eating. We consider these among the best in the Bones gallery. Finally, if you’re going to need help staying awake during a long drive home, the snakes display at the end of the hall will definitely help. The first part of the hall is The Solar System through Time, showing the evolution of earth’s 8-planet solar system over the past 4.6 billion years. A 3-minute video here explains how the sun formed first, and then its gravity attracted the space dust and rocks that formed the other planets. Beyond this is a massive collection of meteorites collected from around the world, explaining where these come from in the universe, what they’re made of, and how you can tell whether a rock is a meteorite (spoiler alert: a good clue is if the rock has high concentrations of elements like iridium, generally rare on earth). The co-formation theory said that the Earth and the moon were formed from the same collection of cosmic dust and rocks. Most of the material coalesced into the Earth, while a smaller portion formed the moon, and the moon stayed in orbit around the Earth because of our planet’s gravitational pull. While it’s true that the Earth and moon are composed of similar elements, but the moon is far less dense than the Earth, something the theory doesn’t explain. The capture theory said that the moon was formed somewhere else in the solar system, passed by the Earth and got caught in its orbit. That would explain why the moon is less dense than the earth while still being composed of similar elements. However, the moon’s round shape and elliptical orbit around earth aren’t like those of other captured moons in the solar system. The giant impact hypothesis says that a planet about the size of Mars crashed into Earth around 4.5 billion years ago, shortly after the Earth was formed. That kind of collision threw massive amounts of debris into space, which, because of gravity, stuck together and formed the moon. When the first astronauts returned from the moon, they brought back rocks from the lunar surface. Analysis of these rocks, and more evidence from later missions, aligned closely with the giant impact hypothesis. Today, the giant impact hypothesis is generally accepted by most scientists. That theory had its problems, though. For one thing, anyone who’s looked at a globe can see that the continents’ shapes kind of fit together like a giant jigsaw puzzle: the right side of South America fits into the southwest side of Africa, while Madagascar, Antarctica, India, and Australia fit on Africa’s southeast. The other problem with the theory was that scientists kept finding similar species of plants and animals on different continents separated by thousands of miles of ocean. Some folks proposed the idea of trans-oceanic “land bridges” that once connected the continents and allowed the animals to migrate, but little evidence of these massive connections was found. In 1912, a German named Alfred Wegener came up with the idea of plate tectonics, saying that all of the continents were once joined together into a single continent some 300 million years ago, and had broken apart and drifted into their current positions. Wegener couldn’t explain how the plates moved, though, and his theory was not widely accepted. Then in 1929, a Briton named Arthur Holmes proposed that Wegener’s theory would work if the Earth’s crust floated on an inner core of molten rock, with the earth’s rotation and thermal convection moving the crust around. It took until the mid-1960’s, when exploration of the deep ocean and sea-floor spreading, to confirm these theories. Today, plate tectonics, continental drift, and a molten-core Earth are the accepted explanations for natural phenomena such as earthquakes, volcanoes, mountain ranges, and more. The gallery covers each of these in detail, showing how the earth’s huge plates come together and split apart. Past the display on plate tectonics, volcanoes, and earthquakes is the Rocks Gallery, with a variety of short displays on the many features of rocks (we’re not making this up). For example, there are small sections of the room dedicated to how rocks erode and affect the flow of rivers and streams; how changes in rock formations can be linked to large geologic events; how rock columns form; and how rock like sandstone, found all around Washington DC, is used to decorate the outside of many buildings because it’s easy to carve. One of the best sections of this hall is the Mine Gallery, built to resemble the inside of several important mines from around the United States. The Franklin-Sterling Hill mine in New Jersey, for example, contains more than 330 mineral species, many of which glow in the dark. The museum dims the lights in this part of the mine to show how these minerals fluoresce, and kids love it. The next mine shown is the Copper Queen from Bisbee, Arizona, which produced more than 8 billion pounds of copper during its 94-year run. The thing the mine is known for, though, is the minerals found there. The simulated underground caves here are the big draw, and show how the caves were formed and the beautiful and unusual minerals found. The final mine showcased is the Morefield Mine from Virginia. It’s small for a mine, around a thousand feet, but it has produced a lot of blue-green amazonite, used in ornamental jewelry. If you’re headed southwest on your way home from DC, it’s about 45 minutes on the other side of Richmond, just off US Highway 360. The final part of the Mine Gallery shows native metals such as gold, silver, and platinum; how miners look for veins – concentrations of metals in a small area - that are easy to mine; and the difference between a mineral, metal, and ore. Almost all of the remainder of this gallery is dedicated to exhibits on gems and minerals. Be forewarned that there are thousands of rocks on display here, and it would take a day or more to examine the details of each one. We’ve outlined the hall’s major subjects below, such as “diversity” and “how gems grow,” and we think the sections on crystal color and shape are not to be missed. If time is short, the middle of this hall forms a “Fast Track” summary of the displays on either side. Unofficial Tip: Regardless of whether you take the short or long tour through gems and minerals, don’t miss the Hope Diamond, in its own room at the end of the hall to the right. The first section of the hall covers pegmatites, including exotic minerals such as lithium and beryllium. These are metals, and what makes them special is their light weight. Beryllium, for example, weighs about 1/4th as much as iron or steel, making it excellent for everything from airplanes to golf clubs. Next up is a section on how crystals grow. Two examples here, under the heading Amazing Gems, are diamonds and calcite. Both diamonds and calcite can be cut into gem shapes, but calcite is far softer, the result of it forming from decaying animals (such as mollusks) and from water interacting with calcium-rich rocks like limestone. Diamonds, on the other hand, are formed by immense pressure and heat, and are much harder. The next section covers the diversity of minerals and how chemical composition is used to classify them: Silicates are formed between silicone and oxygen and form the vast majority of the Earth’s crust; oxides are pairs of metals and oxygen; carbonates combine carbon and oxygen; borates are boron and oxygen, and so on. An interesting display here is the asbestos case, because these minerals look like rocks with fur. One of the most kid-friendly areas in Gems & Minerals is on color; its centerpiece is a huge display of minerals arranged to form all the colors of the rainbow. Minerals get their color in two ways: the base color of a pure mineral is always the same regardless of where it’s found, because it’s based on the wavelengths of light that are absorbed by the molecular structure of the mineral. For example, rubies are red because red light isn’t absorbed by the aluminum and oxygen atoms that make up all rubies. The color of a mineral is also affected by impurities that are mixed in with its elements. The museum demonstrates how mixing a tiny amount of copper in with other minerals produces a green tint, because copper doesn’t absorb green light. That said, the museum has displayed some minerals with very interesting color properties: Feldspar’s uncommon crystal structure reflects a rainbow of colors depending on the angle at which it’s viewed; and alexandrites, with a small amount of chromium in them, look red under a household incandescent light, but green under a fiber optic light. The final major section of gem characteristics covers the shape of gems and minerals. The primary mechanism that determines a mineral’s shape is its atomic structure, since the atoms appear in regular patterns throughout the stone. Other things that influence shape are the relative concentration of those elements to each other; the level of impurities in the rock; and the temperature at which the rock was formed. The museum shows off dozens of different shapes for the same basic calcite crystals, showing how the impurities and forming process change its structure. A highlight here is a huge purple quartz you can touch. The last part of Gems and Minerals is a jewelry exhibit, with earrings owned by Marie Antoinette, and other royalty. 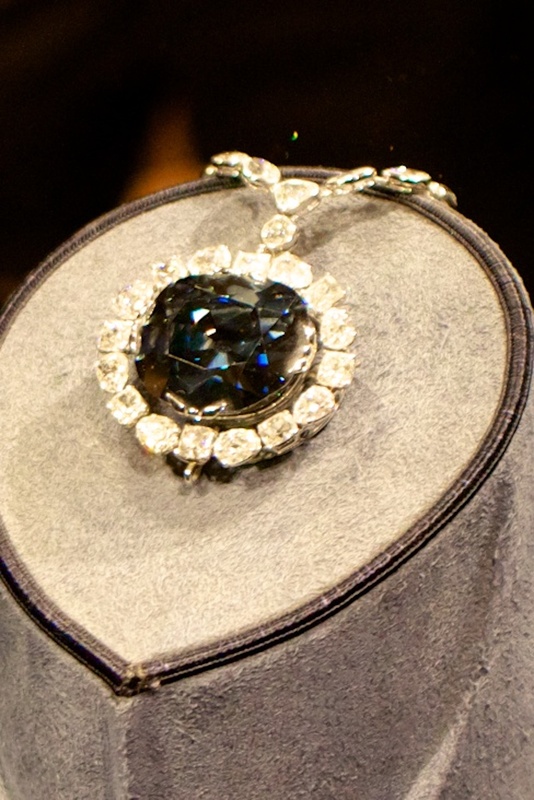 The highlight is the famous Hope Diamond, found in India in the 1600’s, and owned over the centuries by French and British aristocrats, before being donated to the museum in 1958 by jeweler Harry Winston. These are all very pretty gems. The problem with seeing them is that they’re right off the high-traffic rotunda, and people coming in from the walkways stop to look at every detail. It can easily take 15 minutes to see the dozen or so jewels on display here, depending on the time of day you visit. By approaching these gems from the back, as we’ve done here, your wait is minimized, and you can leave the museum when you’re done. 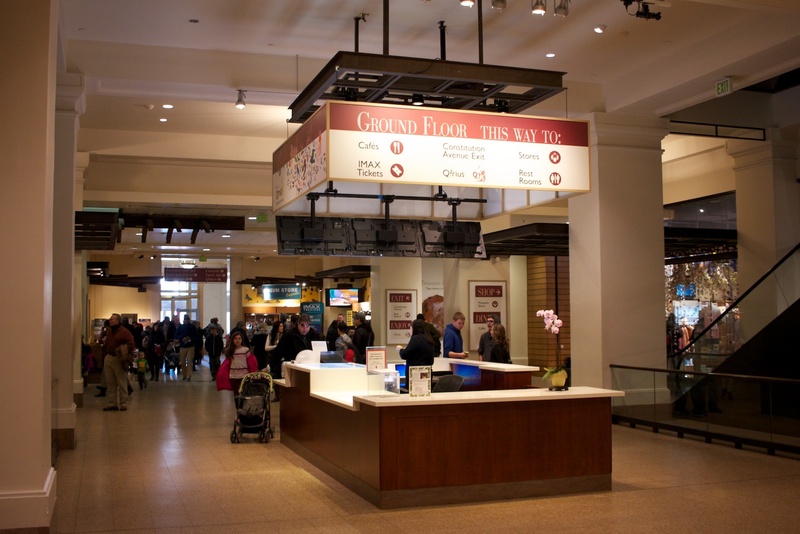 The museum’s food court-style restaurant is on the first floor, featuring sandwiches, roasted meats and vegetables, pizza, pasta, and hamburgers. There’s ample seating, but the area where you order and pick up your food is tiny and chaotic. If you’ve got small children, it’ll be easier for one adult to find seats for everyone and keep the kids with them, while other adults order and deliver all the food. 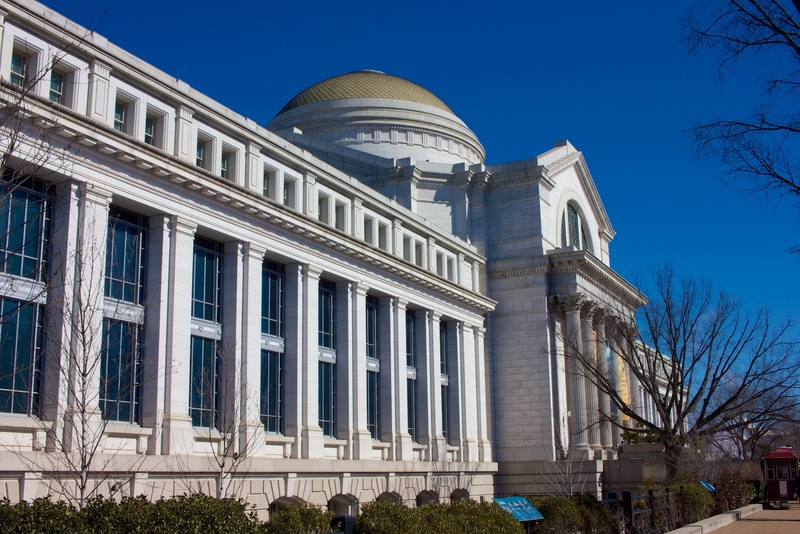 Besides the exhibits, the museum offers a rotating series of nature-based IMAX movies. These are usually to 20 30 minutes in length, many in 3-D. They’re generally done well, but not mandatory for understanding or enjoying the museum. 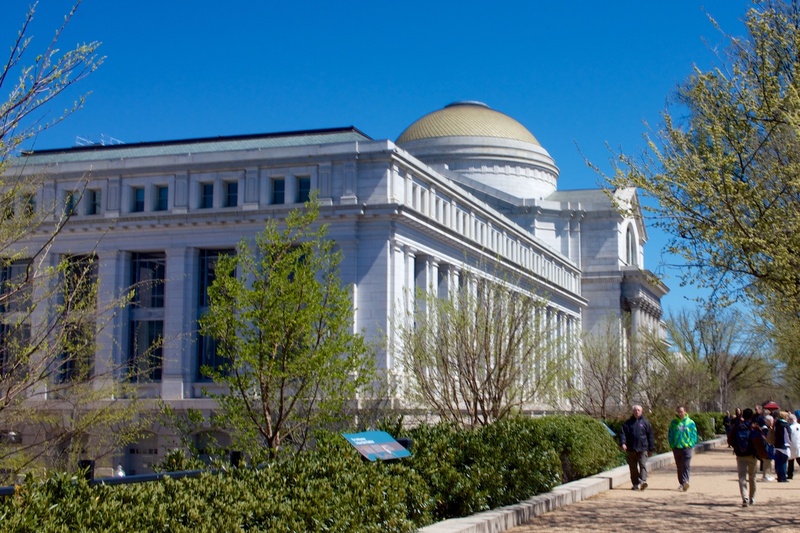 Enter the Natural History Museum via the ground floor entrance on Constitution Avenue. Head to the rotunda on the first floor and view Henry the Elephant. 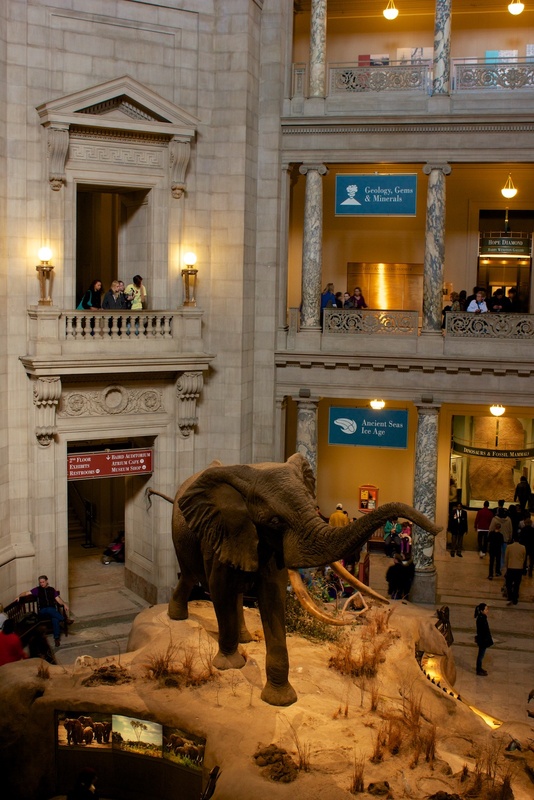 Begin a clockwise tour of the first floor with Mammal Hall. See the African and North American animal exhibits. Skip Australia and South America on half-day tours. Continue to the Hall of Human Origins, including the fossil skulls, Burying the Dead, and Surviving the Dry Times interactive displays. Tour the center of Ocean Hall. On full-day tours, also view the displays on the left and right walls. Full-day tours should see African Voices, behind Ocean Hall. Take a break for lunch on the ground floor. 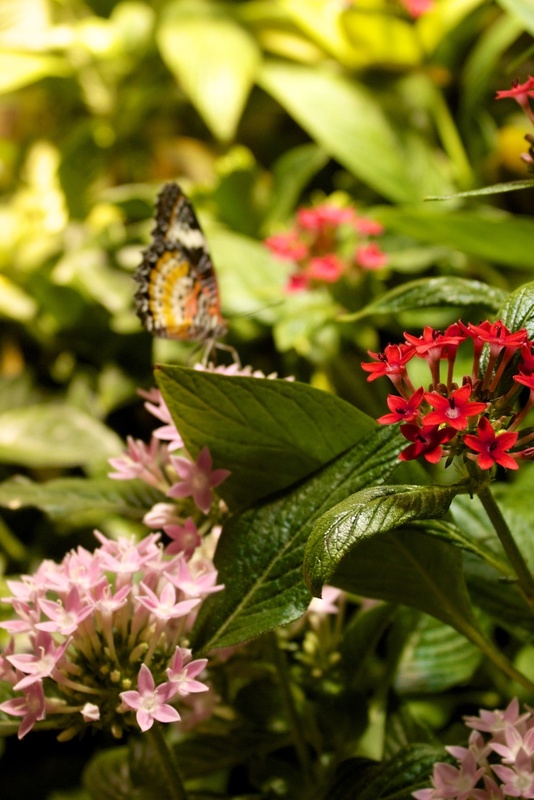 On the second floor, begin a clockwise tour with the butterfly exhibit and Live Insect Zoo. Full-day tours should see Mummies. Tour Last American Dinosaurs and Backyard Dinos. 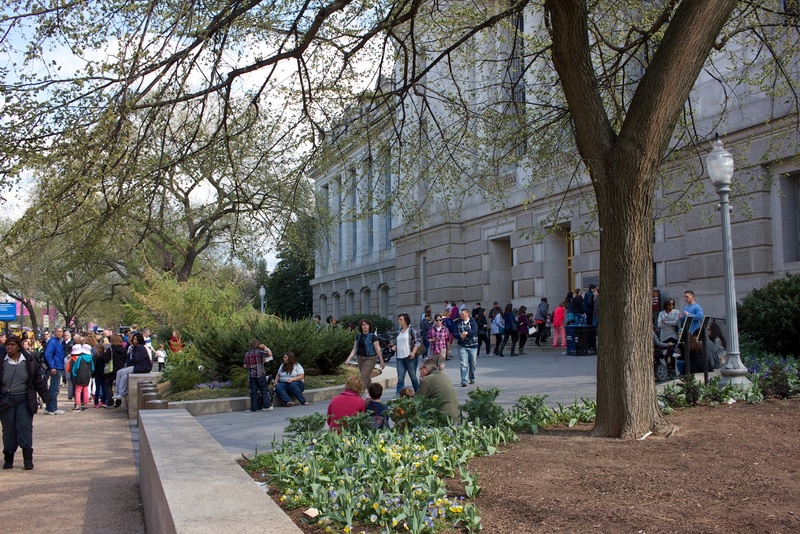 Full-day tours should see Special Exhibitions 3, 2, and 1, plus the Korea Gallery. Tour Geology, Gems, and Minerals starting from the back and working toward the rotunda. 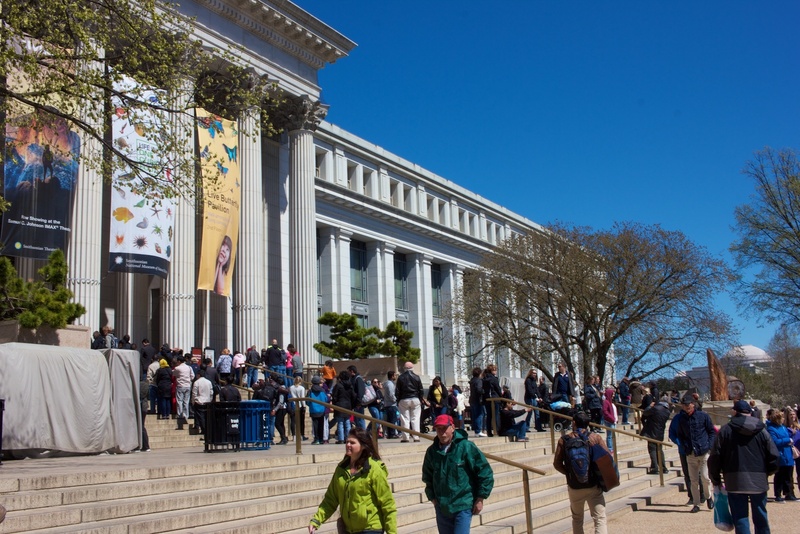 Browse any missed exhibits, see an IMAX movie, or shop the museum store for souvenirs.